Ellis Island opened its doors on January 1, 1892, to the first wave of the twelve million immigrants who would enter the United States over the next six decades. It became the main portal through which people of every ethnicity, religion, trade, and social status arrived in America in the early 20th century. 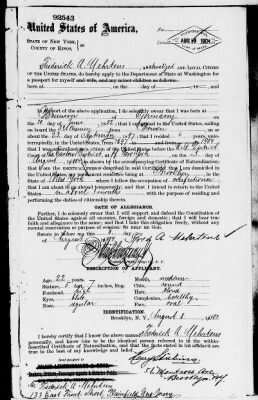 In the naturalization and passport records on Footnote, you can discover interesting facts and stories about those who traveled through New York and other ports to begin new lives in America. In order to become a citizen, an immigrant filed papers to meet naturalization requirements. 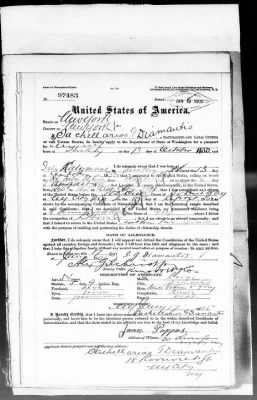 These intentions, declarations, and oaths can provide biographical details of the immigrants, including where they were born and when they arrived in the U.S.
Frederick A. Mehrtens was a confectioner from Germany. 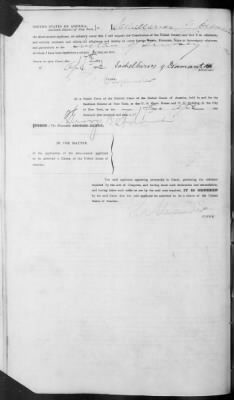 He arrived in New York on September 23, 1897, became a citizen on August 3, 1904, and received a passport five days later on August 8. He is described as healthy, with an oval face, high forehead, medium nose, and round chin. I wonder if the physical descriptions on passports were as subject to “interpretation” as the spelling of names by census enumerators. Things like: complexion-healthy, forehead-high, chin-round seem pretty subjective, especially when dealing with large numbers of people. This is such a great resource to have access to. 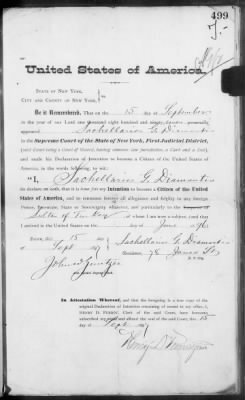 I’ve been able to help so many people find the records of the family coming through Ellis Island. 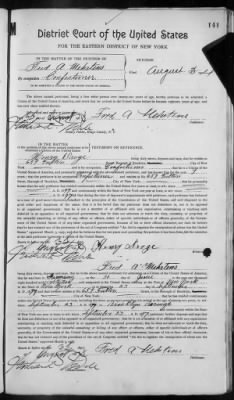 I have found this site very usefull for matters relating to our family history. The Tengdahl name originates from sweden or countries nearby. Keep up the good work as I have spent years doing this tree and would like to keep going. Thank you.